In over two hundred speeches given between 2002 and 2009, President Obama has referenced “special interests” 212 times. This near 1:1 ratio shows a continual concern (if only a verbalized one) for the influence of these allegedly nefarious groups of lobbyists. Mr. Obama is not alone in his derision of the powerful influence such groups wield in government processes. Indeed, this popular campaign topic resonates with a disenfranchised electorate long since fed up with the rampant corruption in Washington. Actions speak louder than flowery rhetoric, though, and the ample record of partnership between government and lobbyists speaks for itself; most congressmen love lobbyists, despite what they claim on the campaign trail. Thus, since the federal government has become provider, protector, and caretaker of all who live under its oppressive thumb, groups of individuals with sufficient resources on hand necessarily see tactical wisdom in partaking in the spoils and diverting the loot into their own coffers. “Special interests”, then, are not the problem; government itself is the problem. A return to the proper and Constitutional size and authority of government would automatically and easily eliminate the vulture-like hovering of “special interests” over the soon-to-be-corpse of America. Congress is a reflection of the people who install its members in office; the blame for their immorality and corruption lies with—and always has been the fault of—”We, the People”. The ability of “special interest” groups to have any audience or influence with politicians is entirely dependent upon the willingness of those individuals to be wined, dined, financially supported, and individually benefited—and our willingness to tolerate such a relationship. It goes without saying that lobbyists ignore those who refuse to help them. Their success in applying pressure on bought-and-paid-for politicians speaks far more about the politician—and his constituents—than it does the “special interest” group. Lastly, the observant reader will note that any reference in this article to “special interests” is wrapped in quotation marks. This is because the term itself is misleading, since each and every person with any shred of concern for America’s future has an “interest” in enacting, rejecting, or preserving any given policy that he or she believes will contribute to its success. The oft-cited problem of “special interests” is a distraction meant to shift accountability and blame for poor policies that financially benefit a limited group of people. It only exists due to a moral deficiency that leads elected officials to be wooed by men with deep pockets. Our focus should be not on these opportunistic agents of plunder, but on those we have placed in a position to hand out our money. Interesting viewpoint, and one I hadn’t really considered at its face. We harp on individual senators and representatives for being corrupt and trading money for antipopulist behavior. After reading this I gather that this is something like treating the symptoms of a disease and leaving the malignance itself untreated. Individual laws to guard against corruption or enabling of predatory corporate behavior may have an effect, though the source of the problem isn’t in lack of regulation. I’m still not completely sold that scaling back government would reduce corporate abuse, though we’ve already tread that ground which goes back to libertarian foundations and that isn’t really the point of this post. Uh… sorry to be the first to comment again :). Two things came to mind while I read it. In our current way of electing political officials, we seem to left with special interest groups. Politicians are elected when they raise money for campaigns. Special interest groups give them that money. 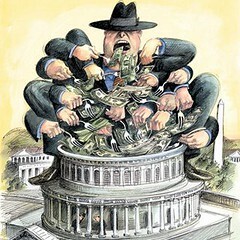 History shows that it almost always the politician who raises the most money that gets elected. My next thought came from your Bastiat quote (that quote is from The Law if I remember correctly). In a society lacking in public virtue, citizens are left with the choice of self-interest. When self-interest is viewed as their only choice, the will always turn to legalizing plunder when times are tough. It’s one of the Darwinian views of human nature. One problem on the political front is that politicians will often criticize something in order to take control of it. We see this in health care. The politicians criticize the health care industry in order to take control of it (often ignoring that the health care industry is a creation of past regulation). By becoming a loud vocal critic of lobbyists, a politician is able to take greater control over the lobbying process and then use that control to an advantage. Since we can’t see the intentions of others, it is difficult for the public to know when a politician’s rhetoric is part of a genuine effort to diminish the power of special interests, or a partisan effort to gain influence with special interests.